2 Bedroom Flat To Rent in Glasgow for £1,300 per Calendar Month. The GPO building has had a rich and deep history spanning 130 years. Designed by Robert Matheson and opened in 1878, the General Post Office in Glasgow immediately became the largest post office building in Scotland. 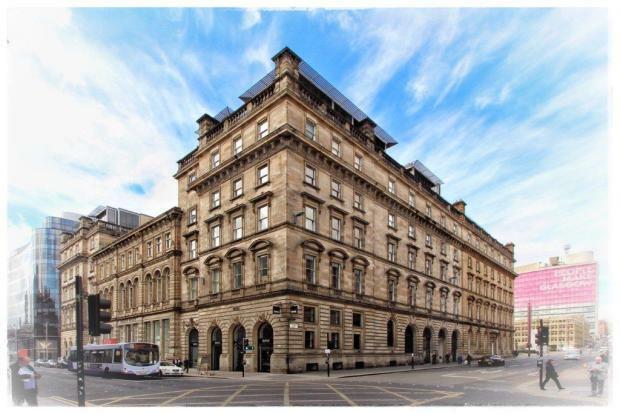 Only the second building in the city to have electricity (after St Enoch Station), this address has always been at the cutting edge and this follows through to state of the art security and stylish functional design. The Royal Mail moved out in 1995 and went to its new home in St Rollox. This half of the building was developed in 2001 as apartments, leaving the GPO as it stands today with luxury apartments in various configurations. Occupying one of Glasgow's best locations on the southern corner of George Square, the apartments share the building with some of the country's finest designer outlets including Hugo Boss and Ralph Lauren, while Jamie Oliver's acclaimed Italian restaurant occupies the side on the square. Across George Square is Glasgow Queen Street Station with an abundance of transport links including trains, buses and taxis to make getting around the city easy. For drivers, the M8 motorway network is just up the road with an estimated journey time of 45 minute to Edinburgh by car. Buses run along St Vincent Street taking tenants frequently to the west end and other areas. Enter the building through the plush, fingerprint entry vestibule, pass the on hand concierge and take the stairs or elevator to the 4th floor where this fantastic property sits. Inside, a reception hallway is floored with beautiful dark wood and provides access to all rooms. The lounge is beautifully appointed and bright with dark oak hardwood flooring and neutral dÃ©cor. The corner position of this home gives excellent views and the flat is extremely quiet even though the bustle of Glasgows 'style mile', Ingram Street, lies below. The kitchen is fully equipped with all integrated appliances and ample work and clever storage space. Both bedrooms are large in size, the master comes with a stunning ensuite bathroom. The main bathroom mirrors the style of the ensuite and has large walk in shower and large vanity mirror. This building is one of the market's favourites. Book your viewing today, and be one of the first to have a look at this wonderful city home.